Sega's 3D puzzle/platformer game, Crush 3D, is now available on 3DS' everywhere. Get a feel for crushin' with the launch trailer. 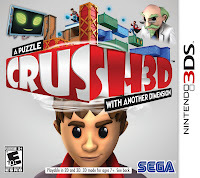 Crush is actually a really different (and fun) experience. I was fortunate enough to play it at the NYCC last October and I can happily report that it's one of the most creative puxxle games I've ever played. It should make you smile if you like a mind-bender.